The Chef's Choice Electric Knife Sharpener is effective at putting a razor sharp edge on a wide variety of knives. Watch the video and see for yourself how quick and easy it is to use. Chef's Choice electric knife sharpeners quickly and easily put a razor-sharp edge on your knives. These high-quality electric knife sharpeners are safe to use on kitchen knives, sporting knives, pocket knives, and even serrated knives. In less than 30 seconds they will make even the dullest knife sharp again. If your kitchen knives are dull you are not alone. If you don't sharpen your knives regularly you most likely have dull knives. To solve that problem I'll show you how you can put a sharp edge on your knives in no time using a Chef's Choice electric knife sharpener. I will walk you through how to use the Model 120, our most popular Chef's Choice sharpener. The Model 120 uses 100% diamond coated disks in the first two sharpening stages and a stropping, or polishing, disk in stage three. Built-in springs hold the knife securely in place against the angle guides, making it extremely easy to use. Stage 1 is used for sharpening only very dull knives; Stage 2 is used for knives of medium sharpness; Stage 3 is used for resharpening. Stage 3 is used most frequently, and if used regularly almost eliminates the need for Stages 1 and 2. I recommend practicing to get the hang of it before you even turn on the machine. First, slip a knife blade into the slot between the left angle guide of Stage 1 and the spring. Be sure not to twist the knife. Move the blade down into the slot until you feel it come into contact with the diamond disk. Pull the knife towards you, lifting the handle slightly as you reach the tip. This will give you a feel for the spring tension before you turn the sharpener on. Now lets get started sharpening. I'll walk you through all three sharpening stages on this very dull knife. First, turn the power switch on. Insert the blade as close as possible to it's handle. Pull the knife through the left slot of Stage 1 by slipping the blade between the left angle guide and the spring while pulling the blade toward you, and simultaneously moving the blade downward in the slot until it engages the diamond coated disk. You will hear it make contact with the disk. Next, repeat with one full-length pull in the right slot of Stage 1. Make an equal number of pulls alternating in the left and right slots in order to keep the edge symmetrical. For most dull blades, one pull in each slot is adequate. I'll use the same procedure for Stage 2. Before moving to Stage 3 you'll find it helpful to confirm that a burr exists along one side of the edge. To check for the burr move your finger carefully across the knife from the spine to the edge. DO NOT move your finger along the edge! If no burr exists, make one additional pull in each of the left and right Stage 2 slots before proceeding to Stage 3. In general, only one or two pairs of pulls in Stage 3 will be necessary to obtain a razor-sharp edge. Again, you'll make alternating pulls in the left and right slots. When you are finished, wipe off any residue and your knife is ready to cut. After a while you'll notice your knife becoming dull again. Resharpen it using Stage 3. If that fails to resharpen, return to Stage 2 and make one or two pairs of alternating pulls. Then, return to Stage 3 for only one or two alternating pulls to put a razor-sharp edge on your knife. As you just saw the Chef's Choice electric knife sharpeners are extremely easy to use. They work on a variety of knives and quickly give you an extremely sharp knife edge. 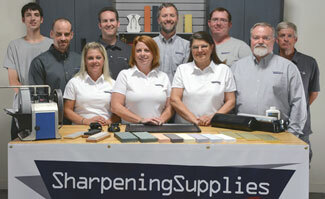 Check out our website at www.SharpeningSupplies.com for more information on Chef's Choice electric sharpeners. Questions about the Chef's Choice 120?